How Much Does Water Well Drilling Costs? 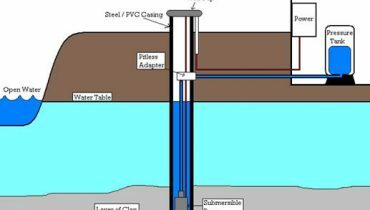 A water well can be difficult to drill, especially if drilling through rock and granite. Wells can be a do-it-yourself job, but when dealing with hard to drill areas it is best to leave it to professionals. Water well drilling cost will vary depending on the depth of the well as well as the difficulty of drilling. If you are drilling the well yourself, plan on just having the cost of materials as your cost. You will need a two inch diameter PVC pipe that is long enough to reach the underground water source. A PVC pipe that is one and a quarter diameter that is long enough to reach the underground water source. Well mesh that will cover the one and a quarter PVC pipe, sand and concrete are also needed as is a well pump. Generally, a do-it-yourself well will cost around $1,000-$1,500 depending on material costs. When a professional comes in to drill a water well, they will determine the depth of the well as well as the type of pipe and pump that will be required for the job. The general rule is about $12 per foot to have a professional drill a new well. So, if the depth is 475 feet the total cost of the drilling would be $5,700. Then the cost of the pump, pipe and labor will be added to that. The total cost of drilling a new water well can reach about $10,000. Pricing is dependent upon the area where you want to drill, the materials required and the labor costs. As the material prices fluctuate, so will the cost being charged to drill a well making the total cost vary. Always consult with more than one drilling professional and get bids and estimates before deciding which company to work with on the job.